We Inhabitat writers have had our fair share of bicycles and bicycle parts stolen on the mean streets of New York City. It seems these days you’ve got to lock everything down (even the brakes!) in order to keep your cycle intact. That often means buying more than one lock and disassembling your bike every time you leave it unguarded. Kevin Scott hopes to change all of that. He just unveiled his revolutionary bendable bike. That’s right, with the push of a lever the cycle becomes bike-Houdini and can wrap around any post making it easy to secure all its parts with just one lock. No more clunky chains? Sign us up! Scott is a 21 year old graduate of The De Montfort University in the UK and was runner-up in the Business Design Centre New Designer of the Year Award. The bicycle he created uses a ratchet mechanism to allow it to be both rigid and bendable — but not all at once. Once you hop off the bike, you simply push a lever on the frame and the bike becomes flexible, so you can wrap it around your nearest pole or bike rack. Scott decided to create the bike specifically so that all of its pieces could be secured easily with one lock. Scott’s bike is a prototype at this point but he’s looking to parlay this technology into a business venture. “I am now going to take this forward to produce a fully resolved solution and hopefully this will be a stepping stone into a career in the bike designing industry,” he says. Anyone looking for a new bike-genius might want to give this chap a call. looks like a great idea - if you don't mind riding a crappy bike. this is along the lines of one of those cars which do double-duty as boats. not fish nor fowl and not very good at either function. what is so hard about locking a regular bike securely? nothing much. if you use the strida, it is usually allowed to be brought into buildings. You could also park more bikes in a smaller area - or at least more neatly :) Put a single pole per bike and have two bikes in place of where one would normally fit. Scott, I understand this is a bendable bike and not a folder, but I can see people using this like they would a Monatgue(26' wheeled folding bike). If you are allowed to take it into a building and put it under your desk (it looks like this bike might fit in a small space when bent), why leave it outside where it can be stolen. So maybe the comparison to a folding bike is not so far fetched. Why not market it from both angles? As clever as that idea for paratroopers is (and I genuinely mean that). 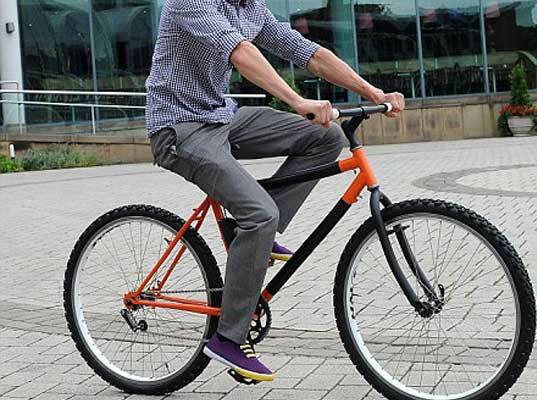 A foldable bike is entirely different to a bendable self-locking bike. There has been many, many bikes which fold in half for decades. None of them entirely bendable and self-locking though. You're not seeing the point here . . This bendable bike was not his new invention. During the second world war this kind of bike, one that folded in half, was sometimes dropped with paratroopers behind enemy lines as a means of getting away on country roads. But this looks like a nice bike. We Inhabitat writers have had our fair share of bicycles and bicycle parts stolen on the mean streets of New York City. It seems these days you've got to lock everything down (even the brakes!) in order to keep your cycle intact. That often means buying more than one lock and disassembling your bike every time you leave it unguarded. Kevin Scott hopes to change all of that. He just unveiled his revolutionary bendable bike. That's right, with the push of a lever the cycle becomes bike-Houdini and can wrap around any post making it easy to secure all its parts with just one lock. No more clunky chains? Sign us up!